Shevan Ellis in his cadet’s uniform. Congratulations to local man Shevan Ellis who graduated from the Toronto Police College last week and is now working as a police constable in Toronto Police’s 53 Division. According to toronto.com, Mr. Ellis came to the Weston Road and Eglinton area from Jamaica in 1998 at the age of 12. He worked in Mount Dennis in the field of mental health and thought that he had something to offer the police in terms of an understanding of mental health issues. Read more in TPS news and toronto.com. The Way Forward was a catchy title used to describe best practices in Canadian palliative care, fostering success and innovation in Newfoundland and Labrador and as of today, the name of a report from Toronto Police. The report was seen to be a necessary response to a crisis of confidence in the force, the growing cost of policing and the need to adopt more modern policing methods. It’s interesting that the public has known about the problems with Toronto Police for years. They have known about the lack of involvement in communities, an overly belligerent response to situations requiring intelligence and finesse and a large body of evidence that police treat certain visible minorities differently. The cost of policing was also an issue that had risen relentlessly in the past few years. When Rob Ford ordered a pay freeze, then Chief Bill Blair just ignored him. Mayor Tory was able to appoint his own candidate as Chief and Mark Saunders has delivered the required report. In addition to knowing about the problems, the public has known for a long time what the solutions were. Namely that police officers should become more visible, get out of the cruisers, crack down on gangs and gun crime, walk the beat and treat all people with respect. To some extent, there seems to be a willingness in the report to do this. While the police should have a base in the community, large fortress police stations could be replaced by several storefronts. Nothing in the report suggests that this will change other than closing some stations. The lucrative after-hours job of paid duty now sees 80% of cops on the Sunshine List. These jobs, such as supervising road works, could be done for a lot less by others. The report tackles this to some extent. Police forces are notoriously difficult to turn around. Part of the problem is that the qualification to apply for the job is a mere Grade 12 diploma – a requirement unlikely to attract deep thinkers. Another is the overwhelmingly male (>80%) and white (>75%) component to the force. Yet another is the complete lack of psychological profiling for suitability. Nothing in the report suggests that this will change. Training needs to be beefed up with the emphasis on the safety of the job – very few police officers are killed or injured compared to construction workers for example. In spite of this many officers react in situations where they show fear rather than courage and the consequences can be deadly for the public. There are several mentions of increased training in the report. Will the new report turn things around? 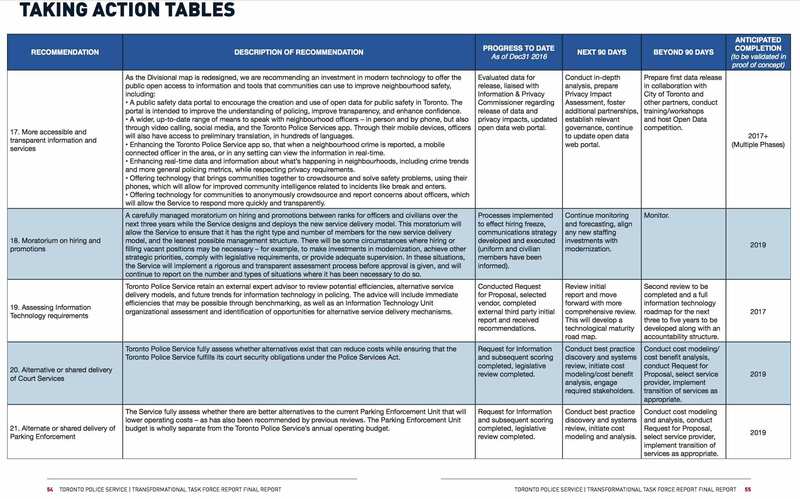 It’s nice to see that there is a set of specific recommendations that are time and performance based so that’s a good thing. The bad thing is that although the recommendations have timelines, many are vague and require more discussion and study. Look for little or no change on these. Recommendations 1-8 (Click to enlarge). Recommendations 9-13 (Click to enlarge). 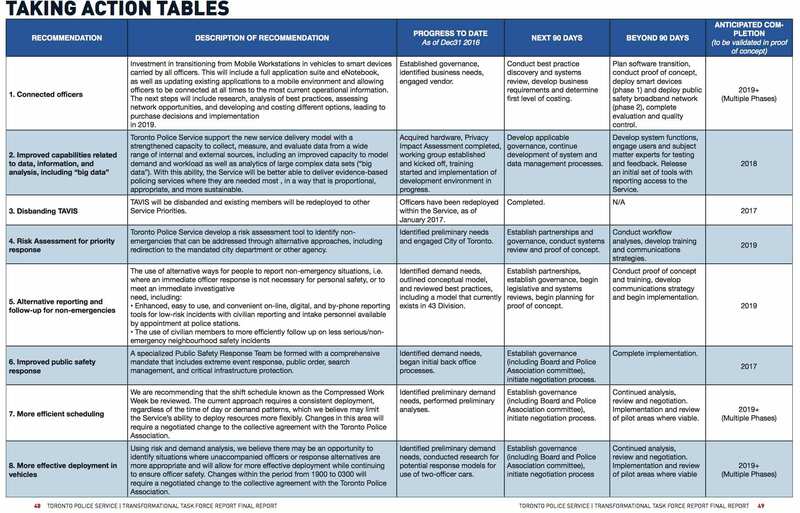 Recommendations 14-16 (Click to enlarge). Recommendations 17-21 (Click to enlarge). Recommendations 23-25 (Click to enlarge). Let’s hope that real change is coming. Read the official report summary here and the full report here. After Adam and I wrote articles about having to be careful when interpreting data, this Toronto Police graph came to my attention. It’s part of their ‘Way Forward’ initiative, already covered, that seeks input from Toronto residents about the future of policing. 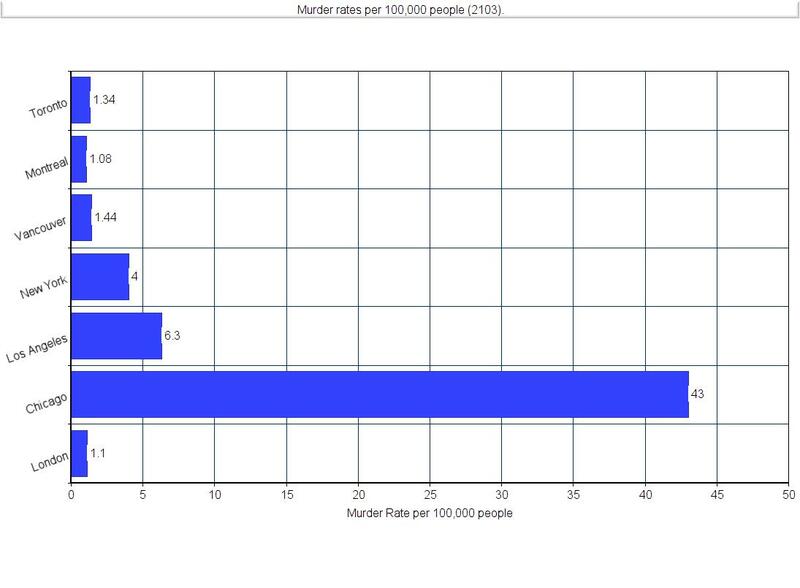 The chart is breathtaking in its deceptiveness and misrepresents the true levels of crime in these cities. 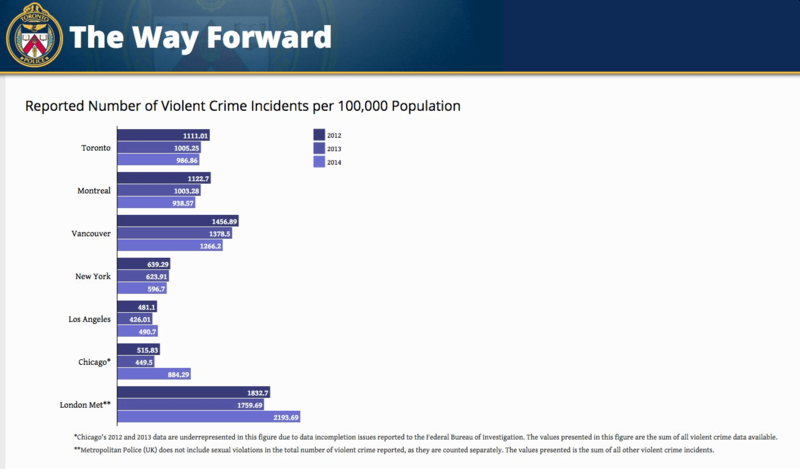 The authors seem to want people to interpret the graph to the effect that New York City, Los Angeles and Chicago have lower crime levels than Toronto. The fine print at the bottom basically informs readers that the statistics are meaningless but who cares, the bars have probably done their job. For those interested, and again, murder being the best indicator of violent crime levels since there’s no ambiguity about a murder – they are almost always reported, here are the same cities’ murder rates in 2013, the middle year used in the police chart, so we can compare apples to apples. Let’s resolve that ‘The Way Forward’ should not be to mislead, or indeed to believe that Torontonians are stupid. The Transformational Task Force was created by Chief of Police Mark Saunders and the Chair of the Police Services Board Andrew Pringle to modernize policing in our City. The Task Force’s Interim Report, released on June 16, 2016, incorporates the views and experiences of a number of community members. 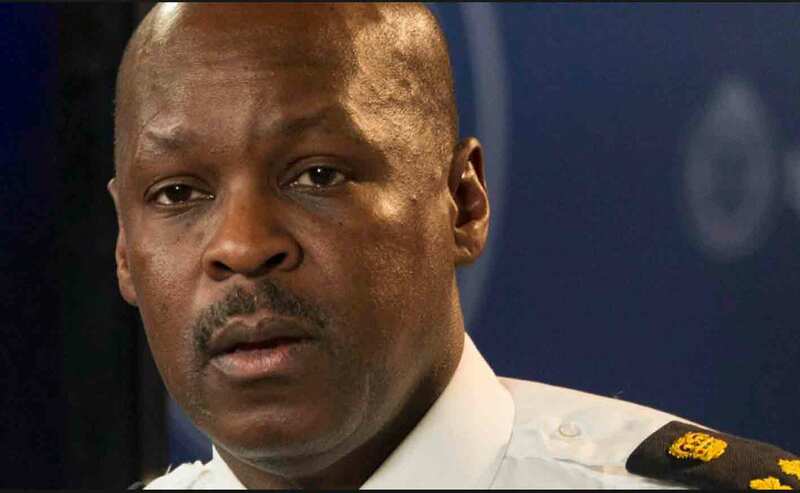 Both Chief Saunders and Chair Pringle have made it clear though, that a wider engagement strategy is needed in order to hear the voices of the residents of Toronto. Your views and experiences are valuable not only to help shape the future of your police service, but also to help create the common ground that is vital to community safety. 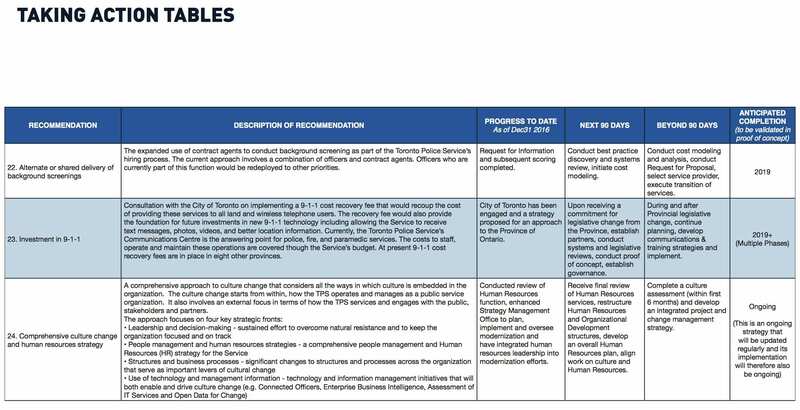 Accordingly, we invite your input on the work of the Transformation Task Force, and more broadly, on the future of policing in Toronto. Where do you feel the Police are needed most? How can the Police better partner with citizens, community organizations, and others to create a safer community? 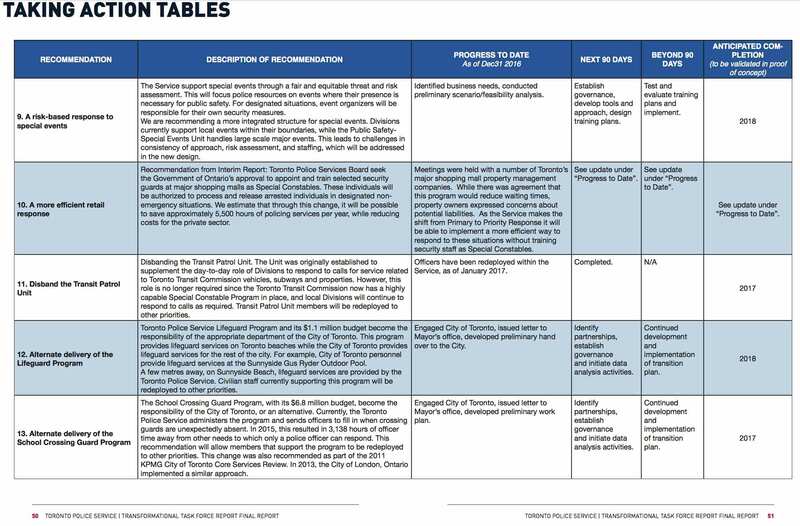 What are the complex safety needs currently facing the City of Toronto? We encourage you to record your comments in a form of a video, and upload it using the form below as .mp4, .m4v, .mov, .mpg or .mpeg file. Please limit your video to 1 min. (60 sec.) in length, at 720p or 1080p resolution. With that in mind and more than a minute’s worth of bitching in me (and having a face for radio) I have sent in the following via email and encourage all readers to send in their own so that the needs of Weston / Mount Dennis can be represented. Readers may feel free to adapt or re-use any of this content. 1. Where do you feel the Police are needed most? With the people. The current reactive model is inefficient and leads to isolation. There is a need for police to be visible and to mingle with all members of the community. Areas of high crime should be foot-patrolled by pairs of officers (not large groups). Establish storefront locations in the city’s high priority areas such as Weston. Do we really need dozens of police and their cars at a crime scene? Is everyone there performing a role or is this a police version of rubbernecking? Surely there is a better way than everyone showing up to that one location? 2. How can the Police better partner with citizens, community organizations, and others to create a safer community? Get out of the cruisers, get off the bikes and stop hanging around in gangs. Be visible and interact with the people – not with each other. Police also need to lose the siege mentality where they feel unappreciated and that everyone opposes them. Barbecues are one-off events – large public housing complexes should be assigned an officer who will be the first line of contact for non-emergencies. Stop seeing people as ‘good guys’ or ‘bad guys’. Most people are neither. Hold more and smaller neighbourhood ‘town hall’ meetings. We don’t need the Chief to be there all the time. Improve those cruddy summer uniforms – they look totally unprofessional. Police need to be in closer contact with the people so that interactions are not considered unusual. Most people don’t belong to community organizations – focus on contacting ordinary people rather than pandering to needy affinity groups. Have regular weapon amnesties so that guns and knives can be taken out of circulation. Offer a reward for weapons that are turned in. The private sector (banks etc.) may wish to throw in some additional rewards. 3. 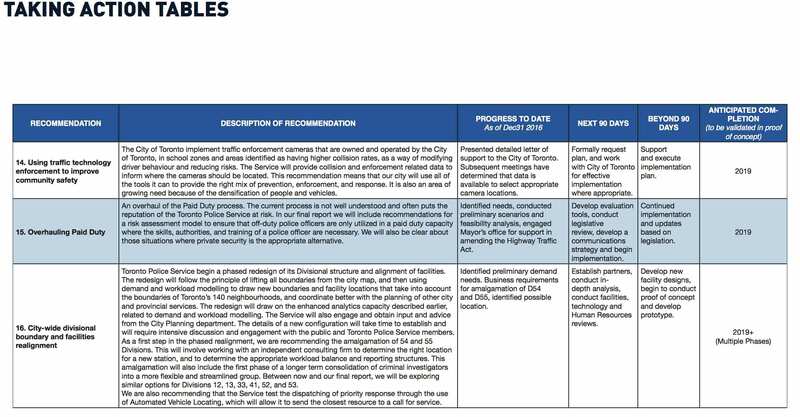 What are the complex safety needs currently facing the City of Toronto? People are generally very safe in this city. There is a need to emphasize that fact so that people don’t feel they are prisoners in their own homes and neighbourhoods. There is an expectation that police officers will have the courage to step in and protect ordinary citizens when needed. Police officers should understand this and either act accordingly or seek a safer role. People should never be stopped because of racial profiling. They also need to feel that the police can be trusted to keep the peace and not escalate situations. Every society has people who are mentally ill. Police should be trained to deal with such people so that shooting them isn’t the first option when they use threatening behaviour. De-escalation of conflict situations requires skill, intelligence and sensitivity. Officers should be rigorously trained in conflict de-escalation and resolution. There is a feeling that police have no time to deal with seemingly minor crimes. Bike and phone thefts for example are not trivial and should be taken seriously. We need creative approaches like bait bikes to send the message that police consider theft to be a serious issue. The province has all-but cancelled funding to the TAVIS program that sent police to troubled areas in the wake of a violent crime spree. The TAVIS program brought cops to Weston for the three summers of 2011–2013. TAVIS had benefits. Cops, especially cops on bikes, were more visible. They participated in community outreach and had community events. They gave a sense that people cared and were trying to put a stop to bloodshed and gunplay that seemed rampant. But there was darkness. TAVIS police were zealous. They stopped minorities, especially young black men, at a disproportionate rate, leading to antipathy. “Engagement” became zealous enforcement and may have treaded too close to harassment. Now, the $5 million dollar program is being cut in half, and eventually to zero. The program will be replaced, though it is not clear with what. TAVIS police officers teamed up with Frontlines youth last week to help with a community clean-up day. The coppers tidied up around the centre and helped out with the barbeque. The TAVIS program sends extra officers to high priority neighbourhoods. Part of their work is, of course, responding to crime, but they also reach out to the community by attending events. On April 27 (after we thought Weston had enjoyed a crime-free week), Police released a couple of crime bulletins requesting the public’s assistance in tracking down a man wanted in connection with an attempted kidnapping on Thursday, April 25 around 1 p.m. near 2079 Lawrence Avenue West. Two men allegedly attempted to force a third into a vehicle, assaulting him in the process. A brave passer-by shouted at the men and the suspects drove off without the victim. 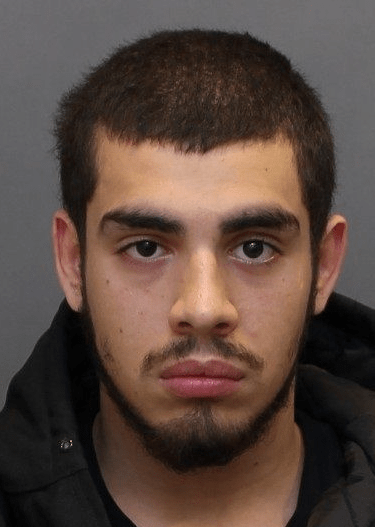 Police have identified one of the men as Eric Coplin−Duran, 18 who is considered dangerous. The police report can be found here. This begs the question of whether the new security cameras provided any information regarding this incident as Weston and Lawrence are quite close by and the car, on the south side of Lawrence, would have therefore travelled east through the intersection. Apart from signs informing people of their presence, no actual cameras can be seen (at least by your correspondent after gamely squinting on several occasions). Perhaps they are so tiny that they aren’t visible. Have readers managed to spot any of the cameras? A second bulletin released the same day reported an exchange of gunfire in the hallway of 1855 Jane Street. One of the alleged shooters by the name of Adrian Scott is being sought along with a second man.